The results of the Newcastle v Bournemouth player ratings by fans. Always interested to see what supporters have collectively made of the latest performance, when using our interactive ratings system. It doesn’t take a genius to work out that if Newcastle had held on rather than conceding the late equaliser, then everybody’s rating would have been higher. However, Saturday’s top star man for Newcastle fans was two goal Dwight Gayle with a rating of 7.5. For once the luck going his way and an alert Gayle scoring twice before half-time. The forward edged out Martin Dubravka (7.4), the keeper following up a man of the match display against Man Utd with another very solid performance, he could do nothing with either goal. Nobody else got 7.0 or better, though four players were rated at 6.0 or better. Matt Ritchie (6.2) had a half-decent game on his return and looked lively, his obvious highlight on his first return to Bournemouth was an excellent run and then cross for Dwight Gayle to score the opener. The other three to get 6.0 ratings were all defenders, with Lejeune (6.9), Lascelles (6.7) and Dummett (6.5) looking more or less untroubled, until the final stages when Bournemouth had a go and Rafa made defensive substitutions. Next highest was the final defender, DeAndre Yedlin (5.9), who maybe has been marked down a little harshly. At the very bottom, we have Ayoze Perez (3.7). Despite Newcastle being the better team for all but the closing stages, Perez once again showed very little in that key number 10 role. It was a smart ball across the box for Gayle’s second but Begovic did make a total hash of it and should have safely collected. Kenedy (5.1) was next lowest with his weakest/quietest game since arriving, most of Newcastle’s attacks tending to go down the opposite side. Jonjo Shelvey (5.7) had a game of real highs and lows. A brilliant ball to Ritchie to help set up the first goal but then missed a sitter at 2-0 and was partly to blame for both of Bournemouth’s goals. A bit harsh I think on Mohamed Diame (5.3), as he did a pretty decent job in the middle of the pitch in helping Newcastle to be the better team for most of the game. None of the subs contributed anything of note in a positive way. 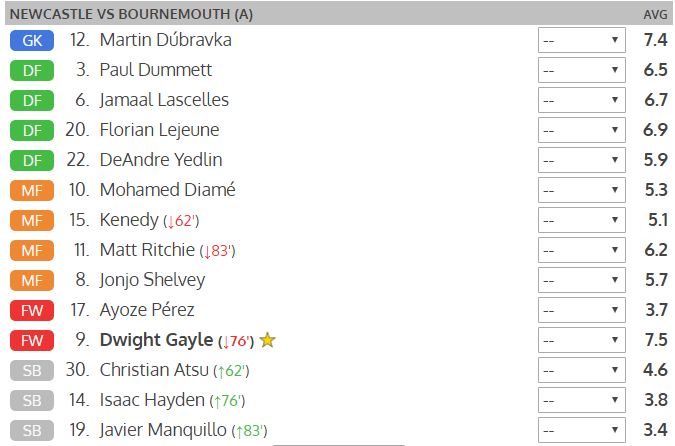 If you haven’t already put in your Newcastle v Bournemouth player ratings, go HERE and you can still input your own marks out of 10 for each player, then check back later to see whether the overall interactive ratings have changed for the team as more fans vote.